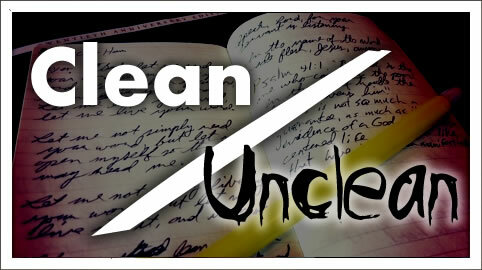 Ever feel “unclean” in some area of your life? What happens when Jesus touches them is not that they make Him unclean, but the opposite. Their presence does not have a corrupting influence on Jesus, He has a cleansing influence on them. Jesus calls His Body, the Church, to act in the same way. The Gospel is not just that “Jesus welcomed me”, but that now we are to welcome others with His grace. Not that we condone or promote sin, but that we trust in Christ to do His cleansing work for others just like He did for us. However, if we’re not careful, it’s easy to slide into a mentality that begins to forget that He is the cleanser and protector, and try to do some of the work ourselves. All too often we feel as if we must work extra hard to stay on God’s good side by our own self-discipline, instead of basking in His grace to set us free. Even worse, we may find ourselves “concerned” when certain people who are not “like us” come among us, because they might be a bad influence, might steal away our hard earned cleanliness. But that is not the heart of Jesus. He is not concerned about the world influencing Him, because He is so connected to the Father and empowered by the Spirit that the uncleanness of others is no threat to Him. He is not expecting us to take over His job and keep ourselves clean by our own effort. He’s inviting us to rest in Him and let Him continue and complete what He started in us. If we have anxiety and worry that we’re not good enough to be loved by God we must relax and remember that that His grace NEVER depended on our effort, only His love (Ephesians 2:8)! And, if we have fear or distaste or apprehension in our heart that leads us to separate ourselves from the “people of the world” in order to protect ourselves, we must repent. We must press in more deeply to the Spirit of God and humbly welcome all who would come, because we were unclean, too, and if Christ’s attitude toward us had been the same as ours towards them, we would be, still.